WHAT HAPPENS BETWEEN 2 PEOPLE RUNNING FROM LOVE AND THEN THEY COLLIDE TOGETHER?? I received an ARC from the very talented author L.A. COTTON in exchange for honest opinion. This is Mismousey’s very honest opinion of LOVE COLLIDES. Having had the honor of reading all of Ms. Cotton’s other books in this series of FATES LOVE. I am truly honored to have been asked to read and review LOVE COLLIDES. Just when you think that Ms Cotton can not take romance one more step she does. She has you begging for more and on the edge of the page reading. You are left wanting to know what happens next in the marvelous story-so much so that you can not put it down. From the very beginning she has you memorized and holds you captivated until the very end of the of story. Leaving you wanting more from her. Ms. Cotton has a writing style which is similar to Ms. Jude Deveraux . Her romance novels are that awesome! From her plot of the story- the characters – the characters comings together with each- the way in the which the scenes jump off the page at you. The design of the cover the book- teasers- blurb. All of these – make the reader want to read the book. Once you do- YOU FALL IN LOVE WITH IT. Not only with the book, but also with the her characters. As we start reading Staci is at her best friends wedding where she meets a man by the name of Kade. After everyone leaves they go up to his room for the night. In the morning while he is in the shower she dresses and leaves he was hoping to have breakfast with her, Staci being who she is runs away. Although we find out that she had to catch a plane out of the country to go back to where she is working, While over there she gets a call telling her that she can start school in 2 weeks. Thinking that it is another college she first says no then she finds out that she will be going back to Gainesville. Where she knows everyone, Staci decides to accept the offer. Once Staci is back in town she and Kade start to see each other but just as friends at first. They attend parties where they meet socially. Kade is dancing with another girl when Staci spots him. Boy does she get mad- he leaves the girl when she goes to get them a drink, Kade ask her for a dance. She accepts one- but they end up at his place instead . Staci had been hurt before and she is afraid of being hurt again. Can she give her heart freely to another? Kade believes that all women only want one thing.And that’s the reason he doesn’t want to settle down with any one. The women are after the same thing and it’s not flowers that’s for sure. This romance has so many twist and turns it. You find yourself needing to know what of they get together. I recommend this book to everyone , especially those of you who love a AWESOME -HOT -ROMANTIC READ !! Mismousey gives it a very firm rating of 60 out of 5 stars. 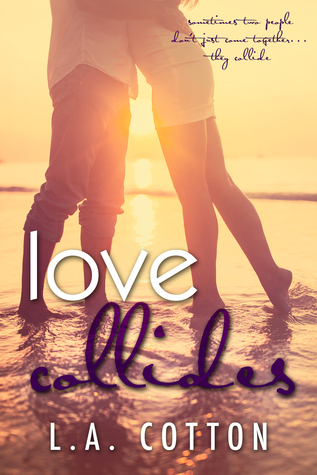 Make sure that you add LOVE COLLIDES TO YOUR TO READ LIST ON GOODREADS. Then off you go to GET YOUR COPY OF IT TODAY!! Ms. Cotton your writing is truly amazing – I look forward to your next book in your Fate’s Love series. You Go Girl!!! ← ITS FINALLY HERE AND TO CELEBRATE BOOK 1 IS ON SALE GET TRIBULATION & TRUTHS BY L.A.COTTON! !